Last December, the release of Google Maps 5.0 for Android ushered in the next-generation of mobile maps where you can rotate, tilt, and zoom in and out of 3D maps. Whether you’re on the go or playing with a new phone, seeing a 3D skyline spring up in New York City, Zurich, Milan, and other cities is a helpful, fun, and unique experience--an experience we want as many of you as we can to have for your city. We've been adding more cities and you will now find that 3D buildings are available in London, Paris, Barcelona, Stockholm, Singapore, Lisbon, Boulder, and 11 major cities in South Africa. 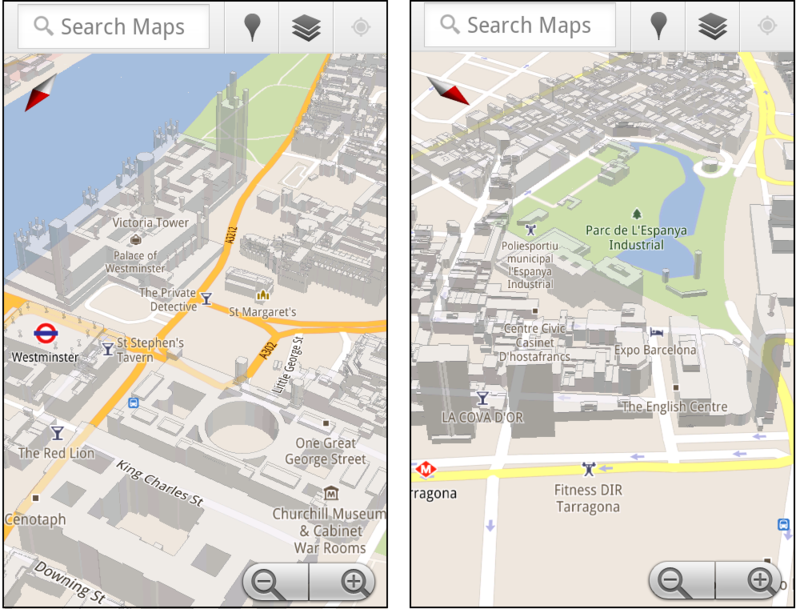 You don’t need to update the app, just open Google Maps for mobile on your phone with Android 2.0+ and zoom in to a city with 3D buildings. Enjoy! Hi guys. I have just loaded maps and there are no 3D buildings in London. Do I need to refresh the cache? Will this be avalebal for the desktop vertion anytime soon? Now just add navigation to finland please. The Google Maps Android app is a truly excellent piece of software. It's good to see a wider coverage on the 3D maps. It really sets it apart from the web app versions on other devices. I noticed the desktop link to maps now has a new icon, love that too, will the Android app be getting that as well? I have an Android 2.1-update1 and it doesn't run. Swedish folks are patiently waiting for navigation to be finally available. As a suggestion,what about rolling it out progressively? 1st Stockholm the the other major cities,the rest is pretty easy,its just forests! South Africans are waiting for Navigation to stop being falsely disabled (I mean it's obvious it works here as some "mods" have proven to me) and for us to also have it so we can make use of these features. I highly recommend android phones but have had some VERY VERY upset friends and family who found out navigation is "unavailable" the hard way. Kinda shocked you guys didn't sort this out for the world cup actually, imagine all the Android users who were lost and frustrated? From the Market, it was noted that Google Maps app requires Android 2.1 and up. But here you stated that it can run on Android 2.0+. Then which one is more appropriate? Oslo, Norway also has 3d. Who needs 3D when 2D navigation does not work? I have used this on my Android phone and found it really good. The 3D views are just amazing. is this a joke ? sweden is not listed. I bought a Samsung S2 and thought that Google Maps was a good app. But i got really dissapointed. I will buy a real nav prog with turn by turn. So the problem is now that i can´t uninstall google maps... i don´t want a app on my phone that is not working in my country. London is not working for me on my Nexus one. Is it only parts of London? I have tired Oslo and that worked.